Following in the footsteps of Daniele Ratto (Cannondale) and fellow Frenchman Warren Barguil (Argos), Alexandre Geniez (Fdj) became the latest young rider to claim a breakaway victory at the Vuelta a Espana. Having escaped early on, the 26-year-old built a huge lead on the climb and descent of the Col de Porte de Bales and consolidated it on the final Col de Peyresourde, reaching the summit a whole three minutes ahead of the only other survivor of the early breaks, Michele Scarponi (Lampre). That the stage finished on home soil for the Frenchman will have made the victory particularly sweet, and the nation now already has more wins here than they managed in their home tour. Vincenzo Nibali (Astana) once more lost no time to his closest rivals, although he and the other GC contenders were put under pressure from an audacious move from Nicolas Roche (Saxo-Tinkoff). Having lost a large chunk of time in the rain yesterday, the Irishman today went on the offensive towards the top of the Porte de Bales. 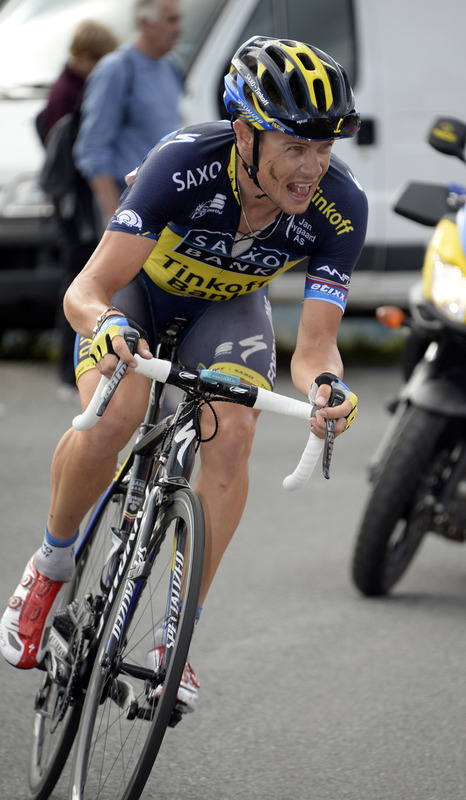 It was a cleverly hatched plan from Saxo-Tinkoff, who had Oliver Zaugg up the road to pace Roche on the descent, as well as Rafael Majka to help him on the Peyresourde. Roche may have been hoping for more than the 17 seconds (including bonus seconds) that he gained over Nibali and the favourites, but with the rest of the top six all crossing the line together with the same time, the Irishman was today’s biggest winner in the GC. His fighting spirit deserves plaudits, and his attack today may yet prove critical in his aim for a podium finish. The other favourites may have remained in deadlock together, but it was not for want of trying. The bottom of the final climb saw attack after attack, with the likes of Joaquim Rodriguez and Thibaut Pinot seemingly desperate to form a selection and with no one team initially taking control at the front. That changed when Chris Horner’s Radioshack teammate Robert Kiserlowski began to pace the group and calmed them down in the process, but was unable to set Horner up for a time-gaining move. The American accelerated within the final few kilometres, but was unable to drop any of the GC top five. To the relief of the peloton there was none of the serious rain that marked yesterday’s stage, although the cold weather prompted the likes of Philippe Gilbert and Zdeneck Stybar to retire. Those remaining in the peloton will hope the weather improves further heading into tomorrow’s (Monday’s) third difficult day in the Pyrenees.